Version 1.08 has been released. I modified it soon and changed uBITX Firmware CEC Version to 1.061.
uBITX Manager also changed Version to 1.01. I released version 1.06 which added WSPR function to uBITX. Beta testers have been very helpful when embedding WSPR functionality. WSPR will continue to improve in the future. By using WSPR before and after QSO, you can check where your uBITX is spreading all over the world. If uBITX Manager is used to put WSPR information into uBITX, uBITX no longer needs any external device to transmit WSPR. The uBITX group's excellent tester also shared a way to use CW Beacon using the Autokey feature (Autokey is a memory keyer built into CEC Firmware.) I will test this later and post it separately. The uBITX firmware has many built-in functions. Most of the features are described on this blog. If you look at uBITX usage on this blog, you can use it more and more fun. Especially WSPR or AutoKey (renamed Memory Keyer from Version 1.06) will be quite fun and useful. 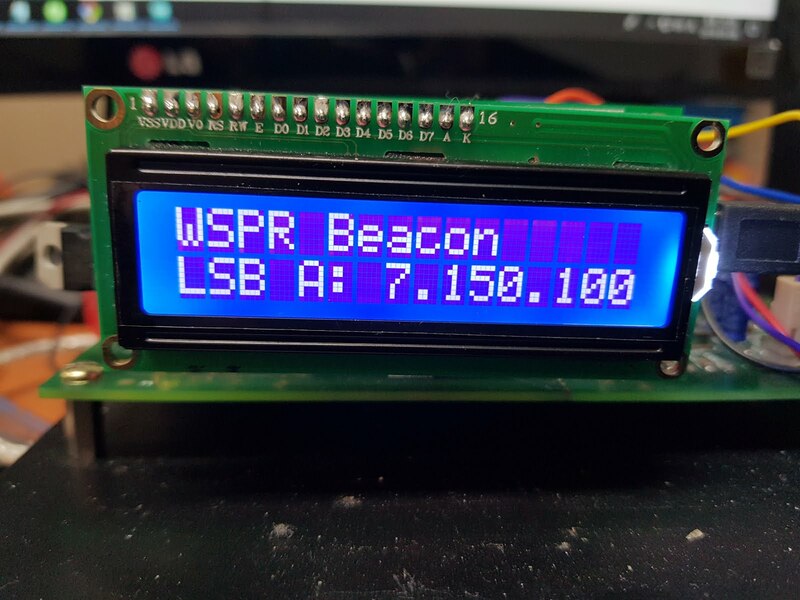 You only need uBITX to use WSPR. No external devices are required. Added second Si5351 control module for WSPR. I needed another control method to control the WSPR frequency. The WSPR band has a choice of up to 2 meters. I think uBITX should be modified when using at over 50Mhz. Waiting for feedback from those who succeeded in 50Mhz or more. And if you want to test 2m band on uBITX, I will send you the test program that I used. This makes the Si5351's clock a little more stable. 7.In CWL and CWU mode, it is possible to manage the use of two options which are displayed by shifting frequency. CWL, CWU mode can be used more easily. If you are in the CWL or CWU mode and you are using the function to shift the receive frequency, please check the option again in uBITX Manager. 9.Even if the uBITX is powered off, the IF Shift setting value can be maintained. If you use uBITX Manager 1.0 or later, you can select options as shown below. If the 'Auto Save-IF Shift Value' option is selected, the IF Shift setting will continue to be maintained even if the uBITX power is turned off. The uBITX Firmware CEC version is open source and the source is in the link below. You can see all the revision history by going to the link below. Thank you for using this firmware. I am afraid that the LPF selection problem is back with V1.06. Need to select the correct band before doing a WSPR beacon. The same as V1.05, before V1.051. If you have time, please test this firmware. Now working fine. Thanks for the quick fix. I also updated uBITX Manager to 1.01. Several features have been added. Upgrade uBITX Manager as well. In the manager i see SMETER..? It is reserved for those who want to install the S meter in uBITX later on. I will support S.Meter soon. But I live quite far away. I am quite interested in your project. I will test the RaduinoI2C board by hand. I have to buy an I2C LCD today. Really Thanks agian for your suggestion. I tried the V1.061 yesterday with an Si5351 with crystal of 27mHz, after changing the settings for 27mHz xtal and compiling, no receive in this version. Version 1.04 works fine with 27mHz xtal. I love this custom uBITX, hope your uBITX will work again. Si5351 clock control module has changed. - But it does not seem to have much to do with your problem. - Modified the part that controls Clock0. I have an question. How did you edit the ubitx_Si5351.ino file? This is because there is a modification at the bottom of ubitx_si5351. If you keep ubitx_Si5351.ino as the original one, you may have problems. I do not have a si5351 control module that uses 27Mhz, but I think if you help, I can solve this problem. If you continue to have problems, please compress all the sources you compiled and send them to me. Well downloaded again from Github 1.061, changed as last time to 27mHz xtal, and all is well. All working fine, must not have compiled or uploaded correctly. Thank you for the excellent software, will look forward to the next update. Congratulations on your uBITX with 27Mhz x-tal coming back to work. I am very good at having various uBITX. I have not had such an issue yet, so I am very interested in this issue. 1. I'm curious about your connection settings. There are things that I set up when I watch my videos. You can refer to it. 2.I wonder if the problem always occurs or occurs occasionally. 3.Please enable 'STOP TX' in the menu and try again. This function can be seen by activating 'Set on'. 4.If you have dummy load, connect uBITX to dummy load. 5.Try using a shielded USB cable. Just go through the tests you can try and let me know the results. If you follow this sequence, your problem may be solved. I have experienced some situations similar to you. I have solved the problem by using a shielded cable that came with the printer when I bought it. first time install of your software...got 1.061 installed but having a rough time with the calibration and BFO settings. Do you have a rough setting for the BFO ?? mine started at 12 mhz plus (should have marked the initial setting down somewhere). I was hearing plenty of signals on the USB setting but trying to get the calibration and BFO to slide over to LSB setting was impossible. Now I got it so messed up that its totally a deaf. If I got a ballpark value for the BFO I think I can get the calibration right. There have been several inquiries about calibration. And everyone was able to solve the problem. Do not worry about your radio. First, I will let you know. 1. My firmware keeps the Master Calibration and BFO Calibration that you used. Even if my firmware is updated a number of times, the setting value will remain unchanged. This is also true of the original firmware. 2.Master Calibration and BFO Calibration follow the original firmware method. You can use the same method as the original firmware. However, the original firmware starts from 11995000 when calibrate the BFO, but my firmware starts with the current BFO of the transceiver. This is at the request of many users. This is the only part of the original firmware that has been fixed in relation to Calibration. 3.My firmware has the same calibration as the original firmware. However, if you are comfortable calibrating in the original firmware, you can reload the original firmware, calibrate and upload my firmware again. Again, my firmware retains the Calibration, BFO, etc. used in the original firmware. 1.I recommend you do BFO Calibration first. 2.Reset the power of uBITX and reboot. 4.Setup On? -> Enter the BFO Calibration menu. 5.Fit in the place where people's voices are best heard. -It will probably be between 11996000 and 11997000. - For reference, I use 11996500. - The exact value of this depends on the radio. - If it is less than 11996000, the LSB and USB may be heard in reverse. - This method is repeated several times (from 1) to set the BFO. - When you are satisfied with both LSB communication and USB communication, please end the BFO calibration. 6.If you set the BFO, Check your frequency display. Many cases do not indicate the correct frequency. If your frequency is correct, finish all calibration. - You have to choose one that is at a relatively precise frequency, such as QSO, Beacon, Digital communication. I usually use 14.074 000 or 7.074 000 (FT8) which is always received. - Perhaps your radio should be tuned slightly below or above the originally known frequency so that the frequency you know will be received. For example, FT8 is communicating at 14.074, but I am receiving at 14.072. -Turn the dial to set the frequency you know. - Master Calibration always starts from 0. - Turn the dial to find where you hear the QSO. - For reference, I heard a sound when the Master Calibration value was 16. - Important : As Master Calibration increases, BFO also increases. Ignore the sound is getting smaller or larger, etc. Please confirm that you can hear the QSO. - Press PTT to end Master Calibration. - Important2 : Be sure to turn the uBITX off and then on. (Because now your BFO will be wrong. When you reboot, you will return to the original BFO. - Please use uBITX Manager to directly input the calibration value and reboot uBITX. - uBITX Manager allows you to back up your calibration values. 9.Most of the uBITX firmware I know maintains the Master Calibration area. But sometimes it is wrong to use the firmware that does not maintain the Master Calibration area, or if the wrong firmware (such as another radio or Memory Keyer for uBITX) is uploaded. In this case, the calibration value will be deleted or has wrong values. To prevent this situation, if uBITX is installed and you uploaded my firmware, make a backup of the configuration file. How to backup the calibration values with uBITX Manager is on my blog or YouTube. 10.Please email me anytime. I can not always check my mail and blog, but I will tell you my experience later. looks like that BFO setting fixed my problem. Don't know why the BFO started at 12mhz. Should have got my electric drill rigged up to get the freq down to around 11996500. I can fool around with it today and get the frequency calibration correct. thanks again for the quick response.....love the software...especially the Manager program. The story of your electric drill was so much fun. The Step to Tune the BFO has been reduced in size by the request of quite a few users of the uBITX Group (Forum). That made you need an electric drill. With uBITX Manager, you no longer need drill. I've been tinkering with your firmware a little and came up with a working version with a Teensy 3.5 and I2C 20x4 LCD. Teensy allows a faster processor with vastly superior memory, SD card support and many more ports. All of your basic functionality is unchanged. I am not really familiar with Arduino. This was the first time I used it. I originally work with ARM, especially Motorola MCUs are very familiar. Many friends I met at Bitx group recommended Teensy. I am so glad that you did it. I am going to make the UI part separate for easy to support various LCD. I will notify you of it. If you get a chance later, please introduce photos or Teensy mounting circuit. Ian for WSPR timing why not use DS3231 i2c module if some code space is left. Alexander RA9YER has built WSPR tx using si5351 + ds3231 and arduino. I had built it and works very well. Your uBITX manager can be used to sync RTC for first time. This is just a suggestion, appreciate your work. I also saw Alexander's great code. It's one of the codes I've studied WSPR. Until now, it was a concept that does not modify hardware as much as possible. Now it is time for us to consider these things. I have converted to using an I2C display using a RadI2Cuno board. The software available is limited and doesn't provide the functionality yours does. Do you have an estimate on when you will put out an I2C version? There is also some functionality that I don't plan to use such as split operation and wspr. Is there an easy way to recompile your software without these so it comes out smaller? I am ordering an I2C LCD and waiting. Version 1.07 has prepared for various LCDs. And if you want to exclude features because of the size of the firmware, you can have up to 10% free space depending on the compilation options in Version 1.07. Version 1.07 I will go through some more tests and post related articles. And I am interested in the Radi2Cuno board. I will buy it when it is released. I just loaded your 1.061. Thank you. It seems to work well. I am having problems getting the audio from the ubitx to fldigi The frequency adjust works and it will transmit show the signal on the waterfall and just stop scrolling. Cant get it to work with winlink too. Suggestions?